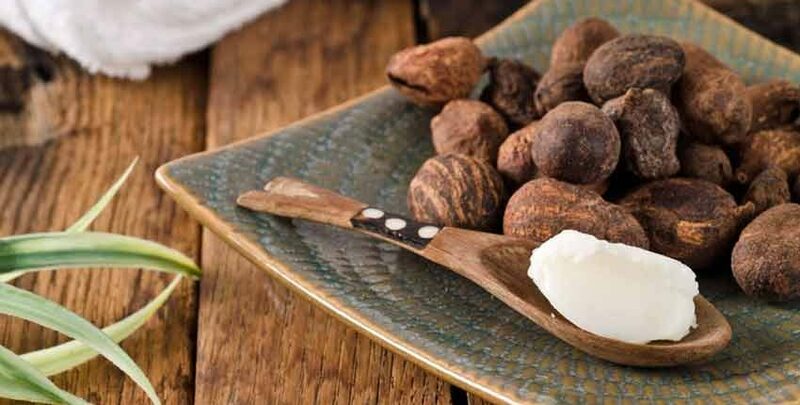 Shea butter comes from the nuts of the Shea tree fruit which grows in Africa. 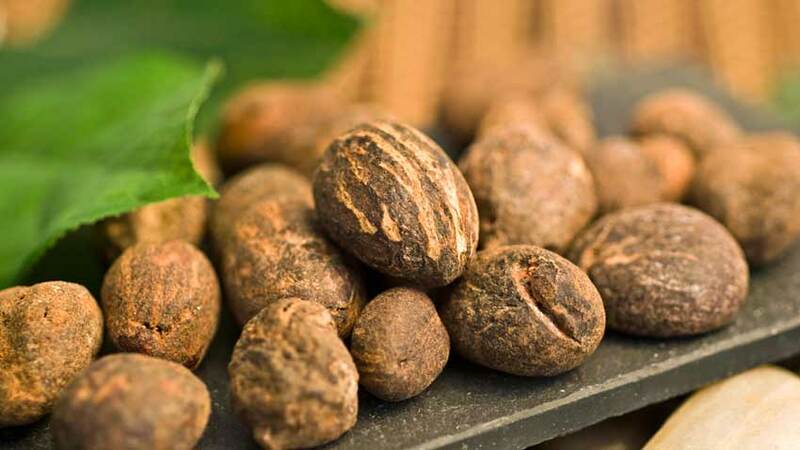 The nuts contain oil that when extracted becomes Shea butter. It is a “superfood” for the skin; rich in vitamins A, E and F, along with essential fatty acids and nutrients for healing. 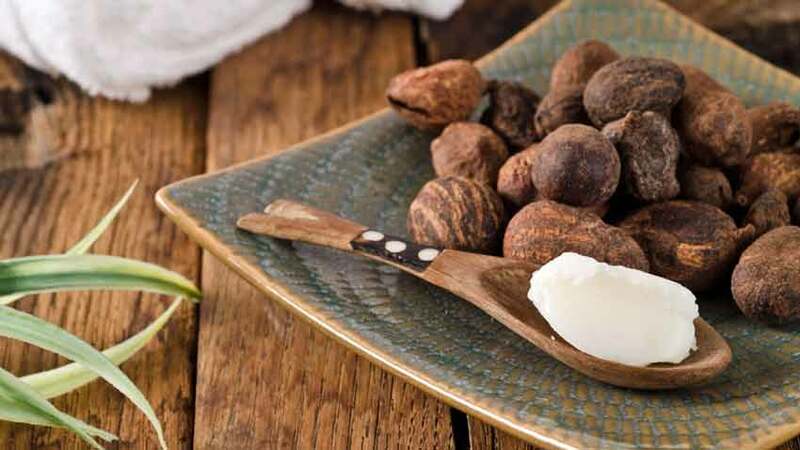 Shea butter has three main benefits that no other natural seed oil has. Other oils or creams may be good moisturizers, but will not heal the skin like Shea butter. Moisturizing – The high concentration of vitamins, essential fatty acids and nutrients closely match what the skin’s sebaceous glands produce. This makes pure Shea butter the best choice for dry or damaged skin. Reducing inflammation – One of the unique compounds in pure Shea butter is cinnamic acid, closely related to the cinnamon in your kitchen. Cinnamic acid is a strong anti-inflammatory agent. Pure Shea butter has exceptionally high levels of cinnamic acid bound to other compounds, making it effective against skin inflammation. Smoothing – Pure Shea butter works with the skin’s natural collagen production to protect and nourish the skin. The high concentrations of oleic, palmitic and linolenic acids naturally found in Shea butter help protect the skin as well. Only pure, Grade A Shea butter that has been prepared without chemicals or heat will have all of the above qualities. Once Shea butter is exposed to chemicals for extraction, bleaching or excessive heat for refining it loses its healing qualities. Most seed oils have two important parts, or fractions. 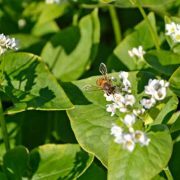 The first fraction contain the moisturizing properties and the second has the healing qualities. Pure Shea butter has an exceptionally large healing fraction, the largest of any natural seed or nut. This healing fraction contains important nutrients, vitamins and phytonutrients required to heal the skin. 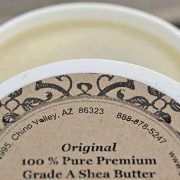 The best quality Shea butter has a healing fraction up to 17%, but is usually significantly over 5%. 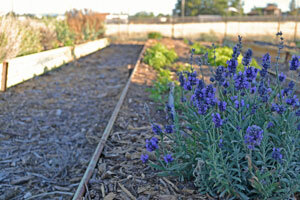 Most other seed oils have a healing fraction of 1 to 3%. 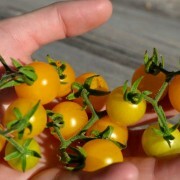 They will have an excellent moisturizing fraction, but little to no healing qualities. 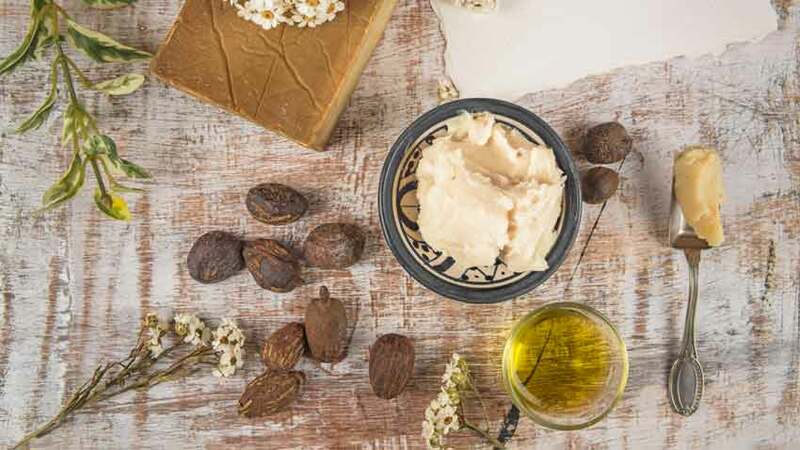 This is why pure Shea butter has been studied and recognized as being effective for skin conditions including blemishes, itching, sunburns, small cuts and abrasions, eczema, skin allergies, insect bites, frost bite and surgical wounds. Original Grade A Shea butter this way! Daily use as a face and body moisturizer – lasts much longer than any commercial lotion. Apply to rough spots 1/2 hour before bedtime. Provides anti-aging properties for skin by boosting skin cell regeneration and collagen production which strengthens skin. Superb as a special spa treatment. One or two teaspoons in a hot bath leaves your skin nourished and hydrated, feeling luxurious all over. Massage butter. Melt a teaspoonful amount in your hands and massage into a sore or tired area. Pregnancy stretch mark reducing and healing cream. Remember the healing and increasing collagen production qualities above? Baby care – wards off diaper rash and keeps skin healthy. Pre-treatment and after care for sunburn or windburn. Excellent make-up remover, moisturizer and healing cream – all in one! The oil will melt and remove long-lasting mascara without stripping your skin’s natural oils and moisture. After make-up removal, massage a small amount into your face for a rejuvenating treatment each night. Best under eye wrinkle reducer and skin toner. Continued use has shown to noticeably improve skin tone and condition. Overall wrinkle fighter. Studies show increased skin tone, tighter skin due to increased collagen content and brighter skin after daily use for four to six weeks. Natural cuticle cream and nail conditioner. Heals rough or torn cuticles while moisturizing and conditioning nails. Surgical wound healing aid and scar reducer. The healing fraction works on speeding the healing of post-surgical scars while the collagen production reduces scarring. Soothes sore or raw noses during cold and flu season. 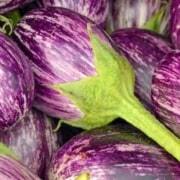 Also heals and moisturizes dry nasal passages, reducing bloody and itchy noses. The British Journal of Pharmacology found Shea butter treats nasal congestion better than nasal drops and lasted longer. Pre and post shaving treatment. When applied before shaving, softens the beard and lubricates skin to minimize razor burn and nicks. Soothes, moisturizes and conditions skin after shaving, giving a refreshed feeling all day long. Hair treatment. Many high end hair treatments from salons contain small amounts of Shea butter, but without the healing qualities. Pure Shea butter seals in moisture, conditions the hair and scalp, reduces dandruff and dry scalp, helps define curls and reduces frizzy hair. Ease delicate skin conditions such as acne and eczema without inflaming the skin. Repair cracked heels and dry itchy feet. Either the Original Shea butter or our Happy Feet work wonders overnight! Insect bite and itch relief. 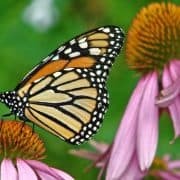 The powerful anti-inflammatory properties work on insect bites to reduce the swelling and itch. We have spent most of the past decade working with a dedicated small company who has developed personal relationships with the best Shea butter producers in Africa. They are members of the American Shea Butter Institute and will only accept the finest batches for their use. We only source Grade A Shea butter – the finest raw and unrefined, handcrafted Shea butter that retains its full healing and moisturizing properties. These are tested for purity and healing quality by the Shea Butter Institute, assuring us there is no heavy metal contamination or chemical impurities. You have the finest quality available at your fingertips! Simply click the link below to visit our store and choose which Shea butter suits you best.